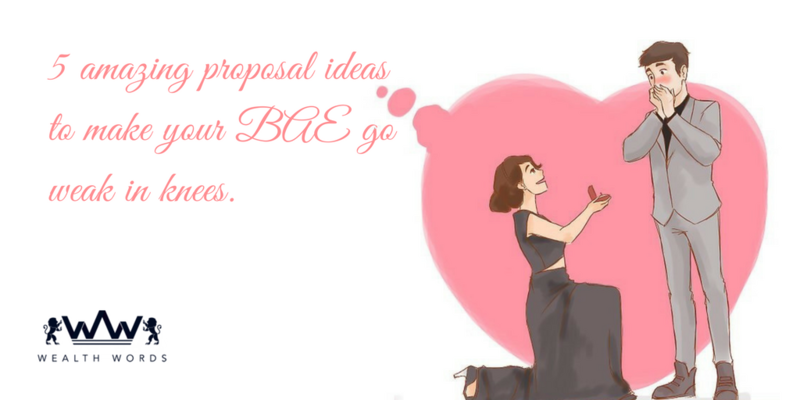 5 amazing proposal ideas to make your BAE go weak in knees. So, you have had a beautiful and amazing journey with the love of your life so far and want to take your relationship to the next level by popping up that million dollar question “Will you marry me?” but, have no clue how to make this once in a lifetime moment unforgettable for your BAE. Are you all worked up and nervous? Don’t be; because we have brought 5 amazing proposal ideas for you that’s not only going to make her go weak in knees but, undoubtedly emotional too as she nods in affirmation and embraces you tight. Excited already? Let’s get you updated then. Here you go. Make it magical through silver screen: If your partner is someone who loves everything larger than life, proposing her with a silver screen moment is going to make her fall in love with you all over again. So, take her out on a random movie date, purchase one of the advertising slides of the theatre (there are plenty of it running before the movie preview) and customize it with some of the most beautiful moments you spent together. From pictures to notes, include everything and as she witnesses this oh-so-sweet scene on the the silver screen, pop up the question. She surely is going to get overwhelmed with happiness. Beaches and sand – savage combo: Who doesn’t love beaches? After all, nature is at its best there. From the wind ushering your hair to the sea waves inducing you with solace, wouldn’t it be awesome if you propose her randomly on a beach out of nowhere? Just write out the beautiful question on the sand, tell her to turn around and voila! slip the ring in her finger the moment she says yes, all excited and happy. How simple and beautiful is that! Scavenger hunts always work: Give your proposal a little of a gaming touch and plan a scavenger hunt for your partner. Initiating with a simple clue and making it a little complicated as she comes closer will surely make the whole proposal process a lot more entertaining. In fact, as she comes near the final location, you can hide somewhere close there and propose her marriage by going on one knee. Imagine how that pretty smile is going to lighten up her face. So much of love in the air! Could it get any better? Sweet notes and surprises: Surprises have always been in, haven’t they? So, don’t you think surprising your would-be better half with a sweet, little proposal note can work wonders for you? It certainly can. Maybe you can put up the question through some alphabetical fridge magnets or write it down with a lipstick on the washroom mirror or even better, slip a little, cute note beside her as she is fast asleep, expressing how you love her and want to have a forever with her. She is surely going to wake up with a big smile on her face and of course, a yes on her lips! Up for a crossword proposal? : While the buzz about crosswords have been doing the rounds since its inception in 19th century, you can even use this intriguing and oh-so-enticing game for proposing your BAE. Yes, create a personalized crossword puzzle with the wedding proposal message and let your sweetheart solve it and smile through tears as the cues and clues take her to the ultimate million dollar question. Doesn’t this sound downright cute? Moreover, once she says yes (hopefully), you can even indulge in a game of crossword or two while you both get lost in each other and unleash your inner wordsmith. In fact, there is this one online crossword ‘Wealth Words’, accessible just through a click which even gives you cash prizes as winnings. Yes, you can win real money here by getting all of its puzzle right. How cool is that! Imagine how grand you can make your wedding with all those huge cash prizes you take home. It would be nothing short of a dream wedding, straight out of a movie! So, be smart, be awesome, register at its website and start puzzling with your BAE, right away! Hope these proposal ideas help you ink your happily ever after beautifully. You can thank us later or even better, invite us for your wedding, okay? Oh yes, we love free food! Crossword puzzles – An enticing way of teaching students.